That’s a piece of folk wisdom that makes so little specific sense that it’s hard to imagine ever using it for real, but consider the story of Robert Miller of Englewood. Everything that went around came around. When Bob Miller swabbed his cheek to leave DNA for a bank for potential bone marrow donors decades ago, he really meant it, but he didn’t expect to be matched. About 10 years after that donation, he was. The match was perfect, and that recipient, who got Mr. Miller’s bone marrow 19 years ago, is not only alive but flourishing. 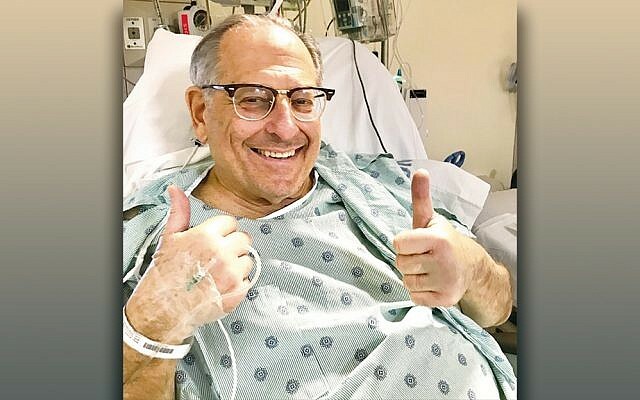 And then, when Mr. Miller learned that he needed a kidney donation, his community responded immediately and overwhelmingly. He got a new kidney, a gift from a live donor, a few weeks ago, and now he’s recovering. His story is a tale of love and generosity and selflessness and hope and faith and resilience — and inspiration. Last week, Mr. Miller, 68, and his wife, Sara Lee Kessler, told that story. Mr. Kessler is a broadcast journalist who won an Emmy Award for “The Gift of Life,” the TV documentary she hosted and produced about bone marrow donors, which aired nationally on PBS. It started in 1989, when Mr. Miller and a friend heard the appeal by Allison Atlas, then a 21-year-old NYU student, who was diagnosed with leukemia and given little chance to survive that illness. She needed a bone marrow donor, and that was the start of the first big Jewish bone marrow donor registry. Her story did not have a good ending — despite signing up about 60,000 people, she did not find a match. “These 11th hour appeals don’t get matches,” Mr. Miller said. She died in 1993, at 24. “But because of the people who registered, she saved hundreds of lives,” Ms. Kessler added. Mr. Miller was among those hundreds of thousands of people who registered to save Ms. Atlas. “About 10 years later, I got a phone call,” he said. He hadn’t entirely forgotten about his swab, because “I had gotten a phone call three or four years earlier, about donating to someone in Houston, but sadly he died” before the process could get very far, he said. “And then in 1999, I got a call that I had matched someone, and I felt like I won the lottery. It also was very unlikely; as it turns out, it is highly unlikely that unrelated people can be matched well enough for a bone marrow donation to be possible. That’s why the bank is done by ethnicity; because there aren’t so many Ashkenazi Jews in the world, relatively speaking, and because until very recently very few Ashkenazim had married out, if Ashkenazim are to find a match, it’s likely to be to another Azhkenazi Jew. The National Marrow Donor Program has its headquarters in Minneapolis, Mr. Miller said. That’s because it was started by the baseball player Rod Carew, who played for the Minnesota Twins, and his wife, Marilynn. The Carews had a young daughter who died of leukemia in 1996; because her father was from the Dominican Republic and her mother was an Ashkenazi Jew, her bone marrow was so uncommon that no donor who matched her could be found. The Carews became very active in establishing the donor bank in the vain attempt to help Michelle Carew, and in funding research in her memory. Although bone marrow donors and recipients rarely meet, Mr. Miller and Mr. Paul did. It happened on the field at Twins Stadium in Minneapolis. “I did it because usually when you hear about bone marrow donations, it’s from the recipient’s point of view, and I wanted people to hear from a donor to encourage others to donate.” It worked, Mr. Miller and Ms. Kessler said; “I plugged their toll free number, and just in our area the lines were flooded with calls,” he added. Was it hard to donate? No, Mr. Miller said. “I was a little sore for maybe three or four days, and I think I had one follow-up visit to the doctor.” The hard part about the bone marrow donation was being matched. When he is asked about the emotional effect of donating bone marrow, Mr. Miller quotes Great Britain’s former chief rabbi, Lord Jonathan Sacks. “He said that when you talk about the meaning of life, it is not about how much money we have, or how many things we accumulate,” he said. “It’s about how we bring God into our lives. “When we do something Godlike, we bring a piece of heaven down to earth, Rabbi Sacks said, and boy did that strike home with me,” Mr. Miller said. So that was the bone marrow donation. What about the kidney? Renewal is a Brooklyn-based organization that supports people who need kidneys. It began as a Jewish organization and still works mainly with Jews, but increasingly it sees its role as working with anyone who needs help. Its website, www.renewal.org, offers would-be donors and recipients a gentle way into what easily could be a terrifying new world. “Renewal gave me hope when I didn’t know where to go,” Mr. Miller said. He didn’t talk much about his medical problems for years, he said. “Really, there was nothing to tell. I was asymptomatic.” He and Ms. Kessler are Orthodox, and they’re members of Congregation Ahavath Torah in Englewood. He’d told the shul’s rabbi, Chaim Poupko, about his health. 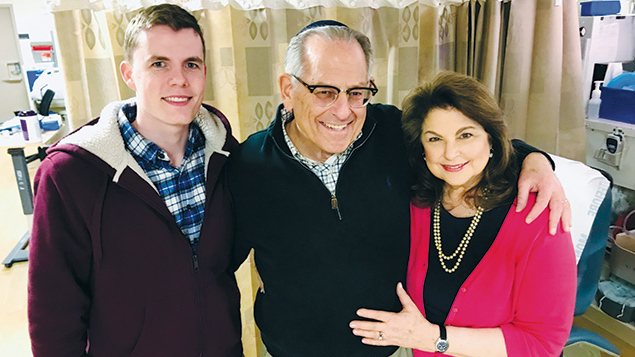 “And then around Yom Kippur last year, I told Rabbi Poupko, ‘Okay, I’m ready for a transplant,’ and he sent out an email the day before Kol Nidre saying, ‘Our friend Bob Miller needs a kidney transplant,” Mr. Miller said. “The response was unbelievable. “You can’t imagine who I heard from, how many people, not only close friends but people I only knew in passing. There were tehillim groups, prayer groups praying for me. There was such an outpouring of love and support. “I was very lucky,” he continued. Still, he didn’t find a donor immediately. The match does not have to be perfect for a donor — Renewal specializes, among other things, in putting together chains of donors, who each gives a kidney to a stranger who can receive it, and the person to whom the donor wished to get a kidney is at the other end of that chain. Just the blood type has to match, Mr. Miller said. Renewal also recruits altruistic donors; people who give kidneys not to anyone in particular but out of a desire to help some sick, possibly dying person recover. After three disappointments, in February the chain that got him a new kidney held. He now has the kidney of an anonymous donor. Mr. Miller now is recovering; it’s a slow process, but headed in the right direction. His immune system is suppressed now. It will come back close to normal, but never get all the way back there. But his life will be back to normal. Soon he’ll be able to go back to work. After many years working in Jewish nonprofit agencies, Mr. Miller has struck out for himself. He now is the owner and sole employee of Silver Streak Limousine; he can use his talent for relationships as he drives people — often repeat customers, often many-times-over repeat customers — wherever they want to go. It’s not a career that’s possible for someone on dialysis. 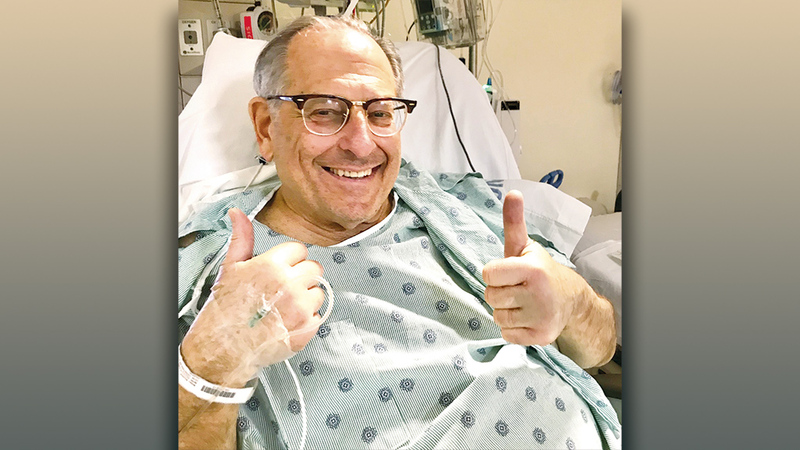 Dr. Stuart Greenstein of Teaneck, a transplant surgeon at Montefiore Medical Center in the Bronx, gave Mr. Miller his new kidney. Dr. Greenstein feels very strongly about his work. “The need for transplants keeps growing every year, and the supply of kidneys does not keep up with the need,” he said. He started doing kidney transplants when he was a young doctor, in 1986 — “I was Doogie Howser, M.D.,” he joked. He went to Montefiore in 1988 and has been there ever since. “I don’t believe in jumping from bed to bed,” he said. “I believe in developing relationships with referring doctors and patients. I had a patient whose transplant I did when she was 13. I saw her a couple of weeks ago; she’s 43 now. That’s what makes you feel really good, when you see patients doing so well. For me, that’s my high. “The need is tremendous,” he continued. “What we have to understand is that transplants and dialysis do the same thing. They keep patients alive. He shares a special tie with Bob Miller. “I have a niche,” Dr. Greenstein said. “I’m Orthodox, and I attract a lot of Orthodox patients. I enjoy them especially, because we get to schmooze. He remembers saying kaddish in a hospital minyan the day of another transplant. It was a rosh chodesh — the start of a new month — and so the Torah was read. That means there were three aliyot — Torah honors — to distribute. The donor was there. Dr. Greenstein is a Levi, so he had the second aliyah, and the donor had the next one; he’s a Yisrael. “Nobody else knew that, but we both got to get an aliyah and share the experience,” Dr. Greenstein said. “That was a special little thrill. “I did the first Renewal transplant,” he added. The recipient was an Israeli woman “in her 30s, who now has five kids. I visit her often.